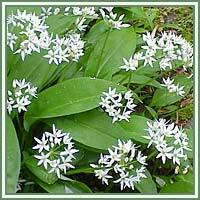 Habitat: Ramson is native to Western and Central Europe. The plant prefers moist soils and slightly acidic conditions. 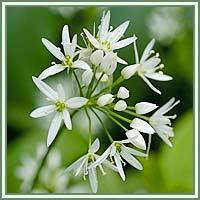 Description: Ramson is an onion-like perennial plant. It grows from a small bulb, forming large clumps. The stem is triangular and long. It has broad, shiny green basal leaves, which are similar to those of Lily of the Valley. Leaves have a distinct, garlic scent. Flowers are white and star-shaped, appearing at the end of a long stem. Ramson is in flower from May to June. Parts used: Flowers, leaves, root. Useful components: Sulfur compounds, such as divinyl sulfide, dimethyl thiosulfonate, methyl cystein sulfoxide. Medicinal use: Ramson is anthelmintic, antiasthmatic, anticholesterolemic, antiseptic, antispasmodic, astringent, cholagogue, depuritive, diaphoretic, diuretic, expectorant, febrifuge, hypotensive, rubefacient, stimulant, stomachic, tonic and vasodilator. The plant is considered to be a very efficient spring tonic, giving a boost to our immune system. It thus promotes the general health of the body, having positive effects on the liver, gallbladder, stomach and intestines. It is particularly efficient in reducing high blood pressure and cholesterol levels. It also has a good effect on fermentative dyspepsia. It eases stomach pains and helps promote digestion, and therefore can be used in the treatment of diarrhea, colic, excessive gas, indigestion and loss of appetite. In form of an infusion, it can be used in treatment of threadworms. Additionally, Ramson can be beneficial in the treatment of asthma, bronchitis and emphysema. A juice made from the plant can be used in weight loss programs. Used externally, Ramson can be helpful as a circulation stimulant in cases of rheumatic and arthritic joints. Safety: There have been some cases of poisoning, so be cautious. Some herbs could react with certain medication. Therefore it is advisable to contact your doctor/herbalist before consumption of any herb.